The sea trip is back on! 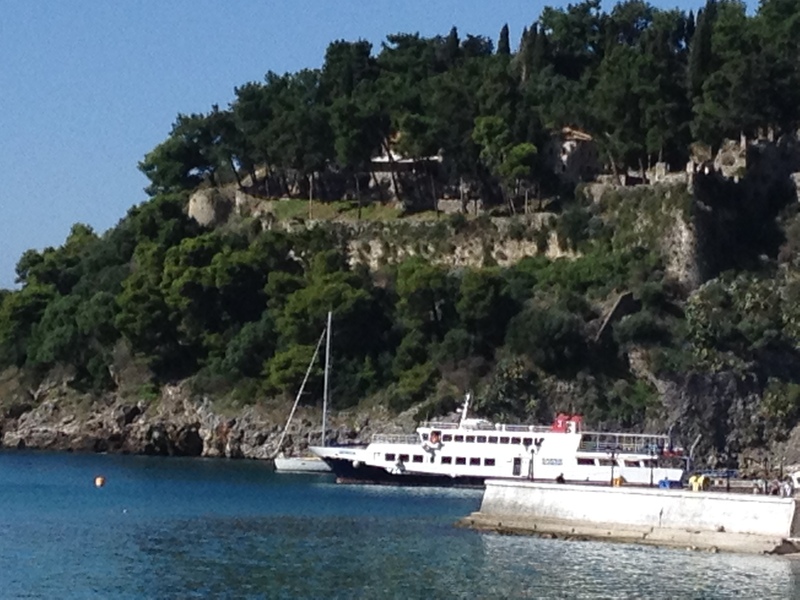 Cancelled on Sunday (day 11), the cruise to Parga and Paxos was running today and we transferred our ticket to it. We managed to be down for breakfast at 7.30, and weren’t the first there. We got to the Aktaion cafe in good time and the pick up coach (a vehicle for carrying lots of people, not a sleazy scumbag) arrived promptly with a Sarris Cruises sign clearly in the window. It’s not a long trip to the port from where we are, but just a bit too far to walk comfortably. The coach route was the one we’d taken on our first day’s walk – nice to see it from a different angle – and then on as far again. There was some paperwork to fill in, a slip of paper with name, gender, age and space for other remarks, presumably so they could identify the bodies if the ship sank. We were given a red plastic boarding card and told not to lose it as it was essential for getting back on the ship, the Georgia, after our stops. We found seats in the sun on the rear deck and waited for the boat to depart. When it did so, and turned south, we had seats in the shade, with a nippy breeze around us. Diana went for a walk and found some empty chairs in front of the bridge, accessible only by going down to the lower deck, under the bridge and back up again. The seats were sawn-off deckchairs only a couple of inches off the ground; anything higher would have blocked the captain’s view. But the position and the sun were terrific. 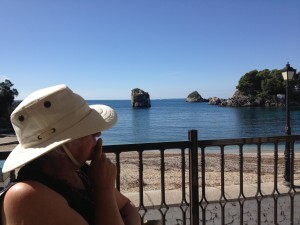 It was about two and a half hours on a calm sea to our first stop, the mainland town of Parga, where we had about two hours to pass. Parga seems very much a resort. The sea front is all restaurants and as we walked to one end the number of closed restaurants increased. At the end of the seafront we found a balcony restaurant with some nice shade for a coffee and a toastie. We then walked back, past the Georgia, and found some narrow side streets with shops and – especially – shade. The sun was high by now, and very hot. 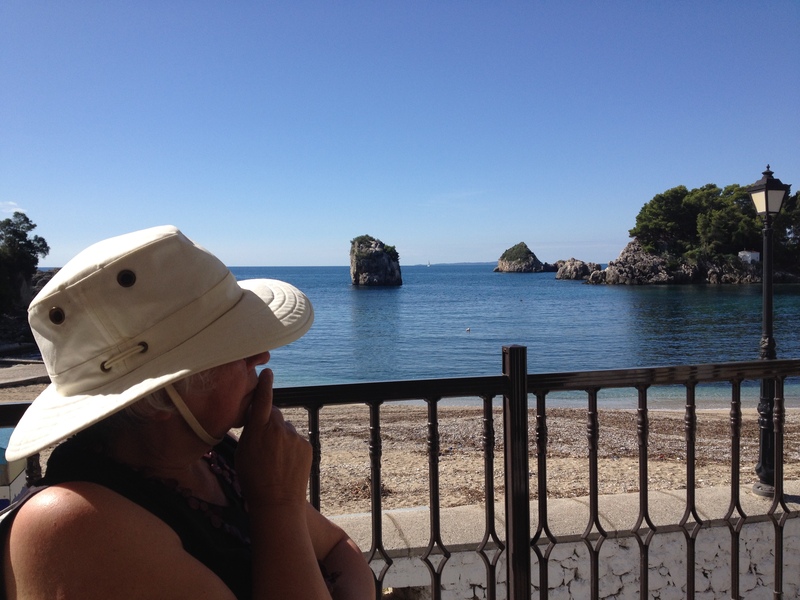 The shops were selling tourist stuff, Parga towels, t-shirts, light dresses (too light for England, said Diana), hats, scarves, fridge magnets, objects made from shells. I particularly liked the catapults, study wooden objects with powerful looking elastic. But Diana said water pistols were better for cats and we didn’t have any nephews the right age any more. We reached the end of the sea front, where the cliffs rose sheer and had ruined stone walls on the top and sat in a relatively shady spot for a while, before going back to the Georgia a bit early to nab a front seat again. The purpose of the boarding cards became clear. A man collected them in and we could see he was counting them. Three yards further on another man handed out out blue boarding cards ready for our next stop, Paxos. A simple way of counting people on and not leaving anyone behind. Paxos was an hour away. As we set off, we could see Paxos and just south of it the smaller Anti Paxos. As a former physicist, I reckon it’s downright dangerous to put Paxos and Anti Paxos so close. If they ever collided, well, total annihilation…! Georgia’s mooring was just inside the entrance to the harbour at the principal town of Gaios, which gave us a half mile walk to the town, following the harbour round past successively smaller boats. The smaller you were, it seemed, the closer to town you were allowed to get. What seemed a closed off, sheltered harbour proved to have an exit. The long ‘headland’ was an island. 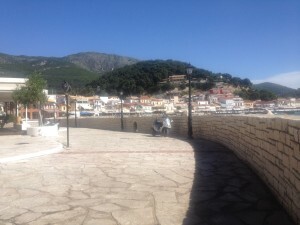 The buildings were more spread out than in Parga, restaurants were clustered round squares, though here, too, many were closed. It seemed that most of the people walking around were off the Georgia. Coming home, I didn’t want to sit at the front. The low seats weren’t good for my back. So we sat at the back with good views to the side, but in the full sun with no cooling breeze. We went forrard and sat on a ledge right in the prow for a while, then retreated inside where there was air conditioning for the rest of the voyage. Several coaches were waiting to collect people. We found one that had a notice saying “Aktaion” and got on. Familiar as we were with bus and coach routes by now, as the coach reached the road next to our hotel, we asked to get off early, which the driver seemed happy to do. It was a good day out, but spending time in a couple of resorts reinforces our view that we like to have streets to walk and places to see on our holidays, not just swimming pools and bars. Being based in the Old Town was a good idea.